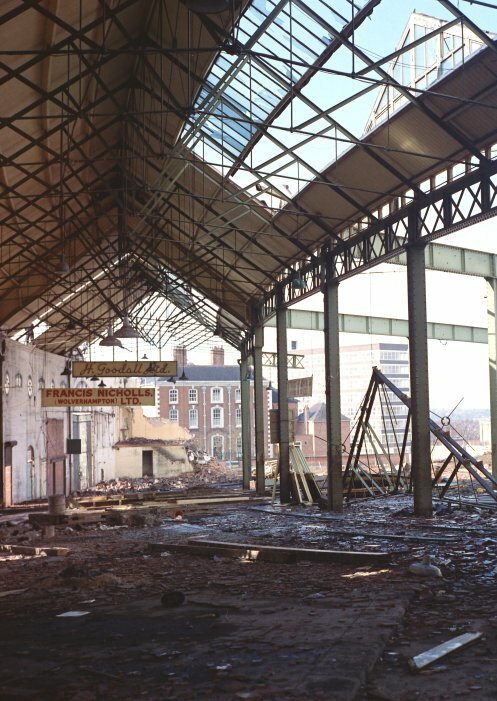 Wolverhampton's fine wholesale market is sadly missed. It was designed by J. W. Bradley, and built in 1902 in brick and terracotta. The elegant building lay along the northern side of the old market place, opposite the Retail Market Hall. 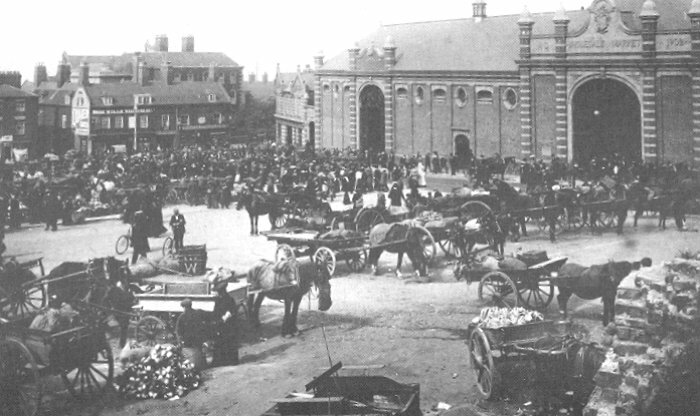 A view from an old postcard showing the market place. The Wholesale Market is the building that lies along the bottom left-hand side of the square. The building on the opposite side is the Retail Market Hall which opened in March 1853, and had a wonderful cast iron and glass interior. It closed in 1960, and was demolished in January 1961. Other prominent buildings are St. Peter's Church with its fine gardens along the eastern edge of the square, and the Town Hall on the western side. The aerial view was taken in 1931 or 1932 as can be seen from the building site on the left-hand side of the Wholesale Market, where the Wolverhampton and Staffordshire Technical College was under construction. The "Market Patch" was not only used as a market place but also for other activities including the annual fair. 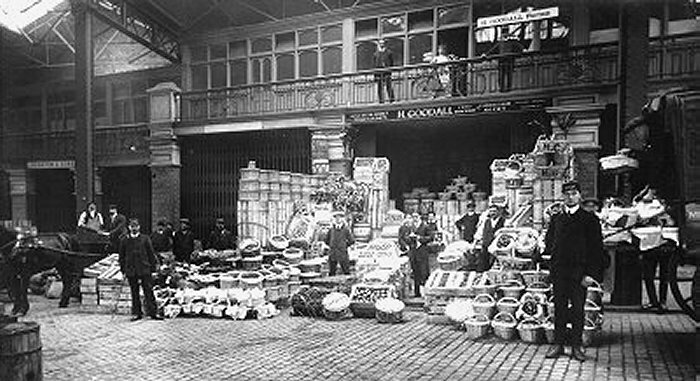 On Saturday evenings the market would often often be crowded with bargain hunters. Any remaining fresh items were sold-off cheaply, and people set up soap boxes to give the passing customers the benefit of their opinion on matters religious, political or whatever. A much earlier postcard shows the wholesale market to the right. Giffard House can just be seen behind the shops at the bottom of the market patch. Courtesy of Alex Chatwin. 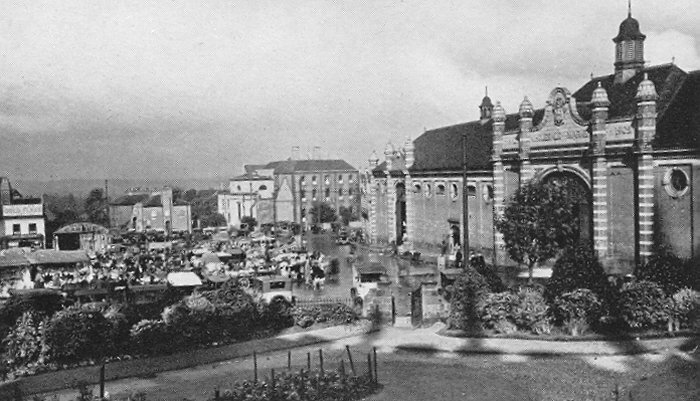 The Wholesale Market dominated the northern side of the market square, as can be seen in this mid 1930's photograph. A local resident, Mary Alcock, remembers in the 1930s, her mother persistently heckling a Black Shirt speaker, which lead to other members of the crowd chasing the speaker off his soap box and pursuing him round the market patch, beating him up as he fled. The van in the foreground bears the name R. Kay, who sold fish and fruit. On the right is what was then "the Tech" and is now the University. 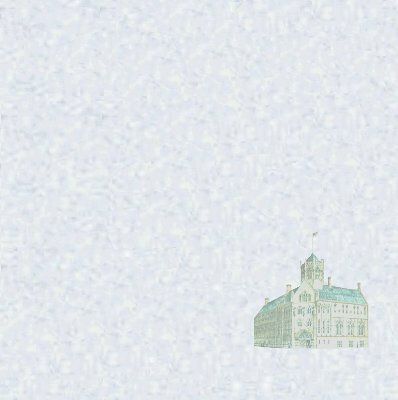 Beyond it are the buildings of St. Peter's School. 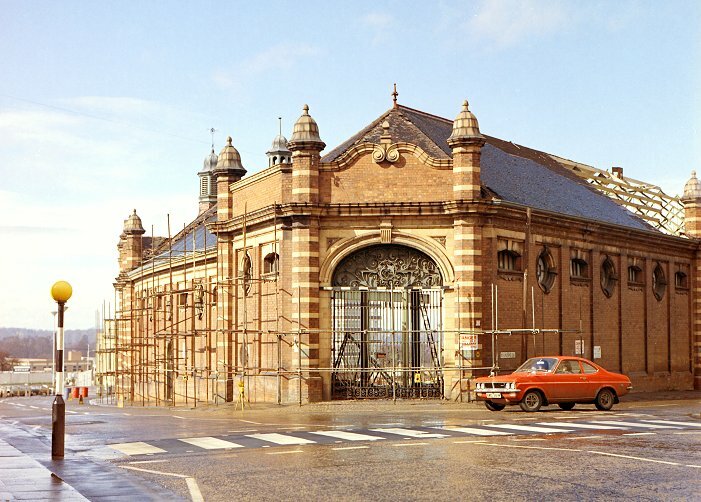 The two photographs from the early 1970's, display the excellent proportions of this ornate and elegant building. 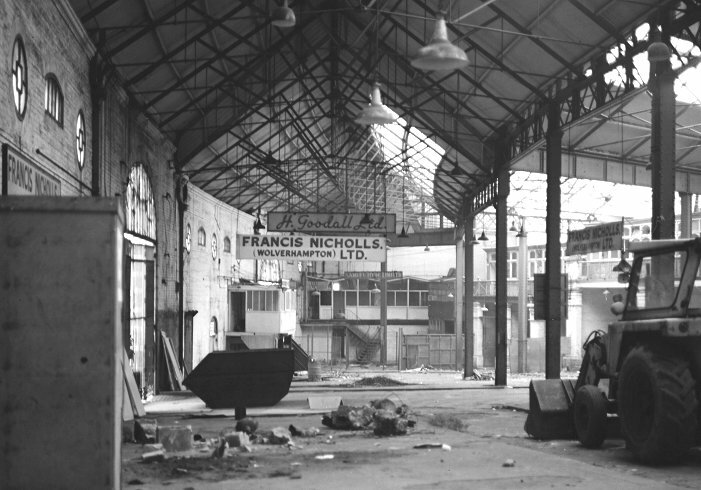 This photograph taken in 1973 during demolition shows the wonderful exterior decoration, and the superb wrought-iron gates that were such a feature of the building. The main entrance with its intricate and decorative ironwork. The town's coat of arms was displayed on the tiles above the name. 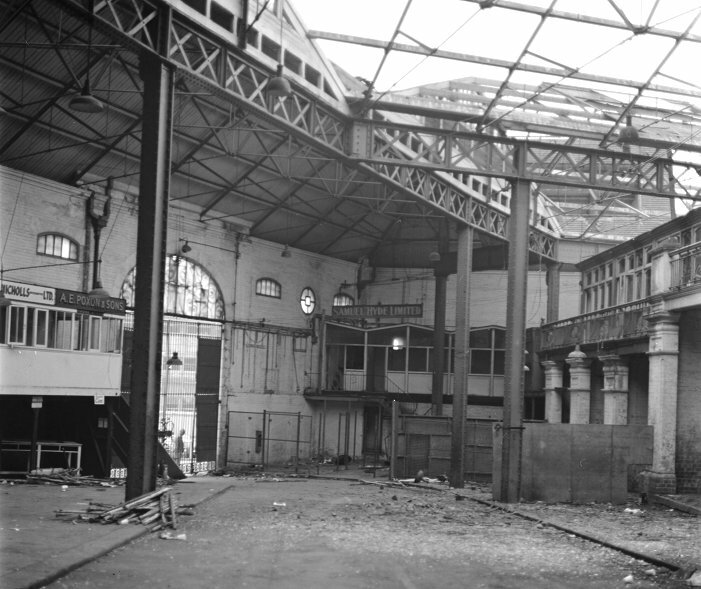 The interior in its heyday. All of Goodall's staff, the horse and cart, the boy on the bike, and all the fruit and veg. pose for the photograph. From an old postcard, probably early 20th century. Thanks to Alex Chatwin. The main entrance from inside, looking towards the western end. 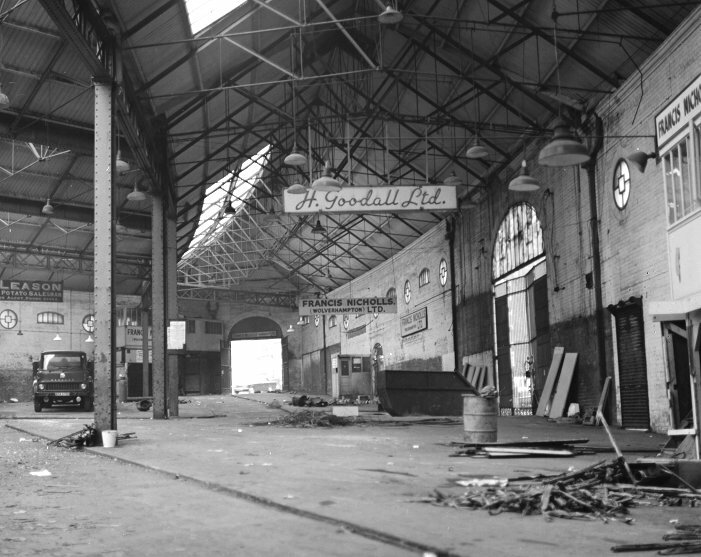 The photograph was taken a few days after closure when demolition work had just started. The western end showing the offices on the back wall, and above the balcony to the right. Another view of the western end showing the offices that were behind the front wall. The view looking towards the eastern gate gives an idea of the overall size of the building. 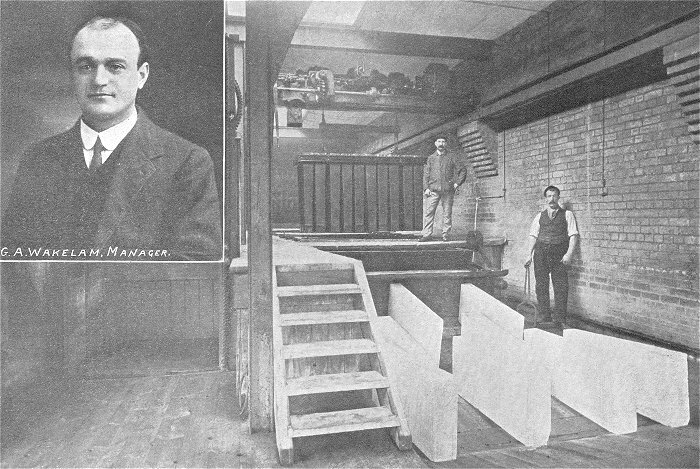 Wolverhampton's Cold Air Stores and Ice Factory, which adjoined the Wholesale Market. 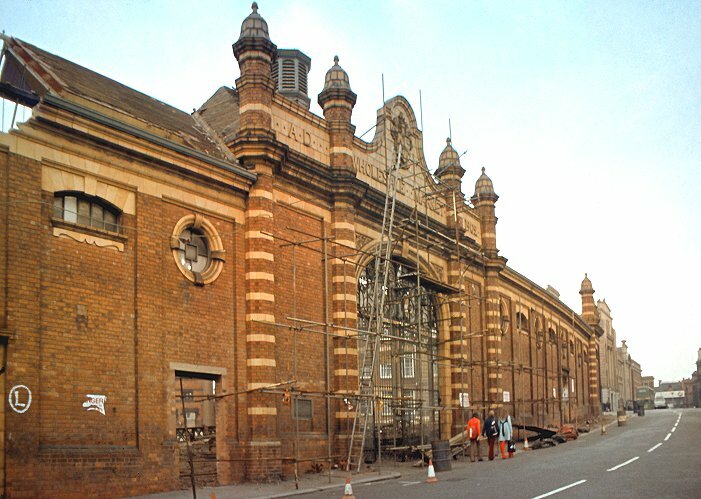 Wolverhampton Cold Stores and Ice Factory adjoined the Wholesale Market. The manager was Mr. G. A. Wakelam. There were five cold store rooms and an ice store, which together had a storage capacity of over 20,000 cubic feet. The ice plant could produce 10 tons of pure clear ice each day. The most up-to-date equipment was used, and the temperature of the rooms could be varied to suit the requirements of the various goods in store. The stores opened on Saturdays and week days to receive and deliver goods between 7 a.m. and 5 p.m. Goods were also received on Saturdays, between 10 p.m. and 11.30 p.m., and on Sundays between 8 a.m. and 9.30 a.m. 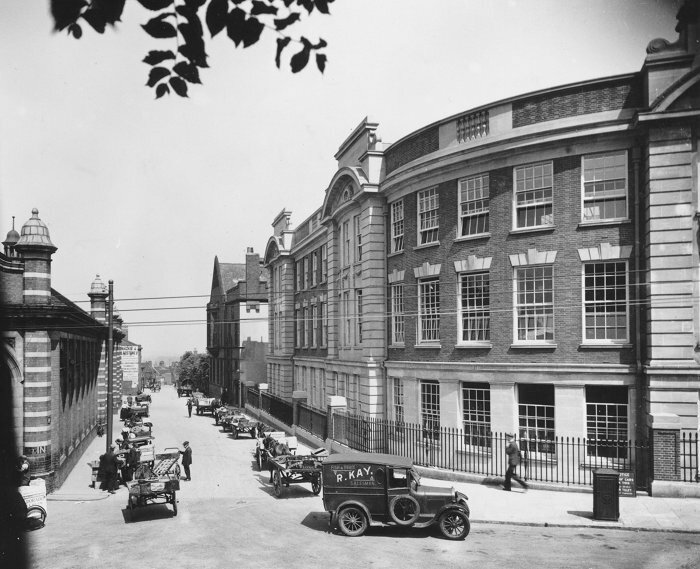 The facilities were extensively used by butchers, fish, game and poultry sellers, dairymen, florists, provision merchants, brewers, and yeast merchants etc. Giffard house can be seen behind the ruins of the market. 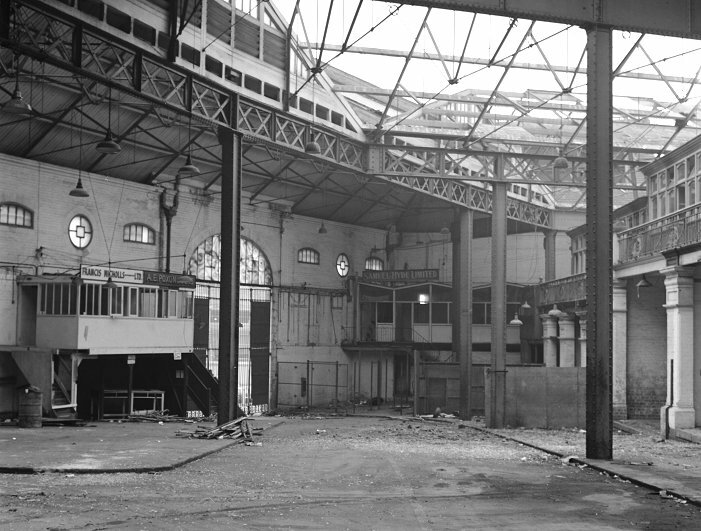 The building was demolished in the spring of 1974. It seems that the only thing saved from the wreckage was some of the wrought iron work which was displayed in a corridor of the arts block of the University - and may still be there.